We are in the mountains now, calling you from our beautiful lodge in the Caucasus Mountains. We settled in after a long day, a good day. 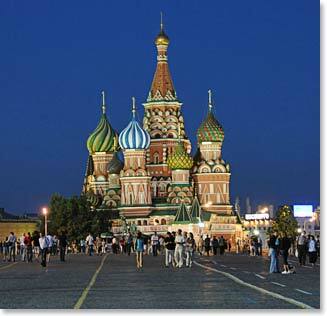 It’s amazing because we woke up in the Park Hyatt Hotel in Moscow this morning and we had fantastic memories of our visit around Moscow yesterday; walking through the Red Square, looking at St. Basil’s, being on the Metro. Rob, Gord, Chuck and Rafael went into the Kremlin while some of us took it easy around the Park Hyatt and tried to get our heads straight to move south to the Mountains, which we have done. 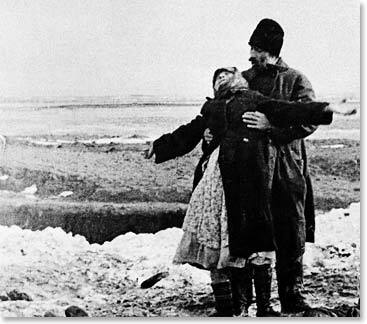 You know there are 6 million cars in Moscow, the suburbs, and it seems they were all on the multi-lane roads every day. So we had Larissa meet us in a nice bus for the quite long ride to the Sheremetov Airport, not long because of the distance but because there was quite a lot of traffic. Being in such a 21st century city, knowing we are heading to the mountains, was amazing but actually when we got here to the mountains it seemed even further away. Life is much simpler here, and we’ve got the satisfaction now of knowing we have moved into one lodge for the next several nights. Mt. Elbrus is above us and of course we will go up there to begin our climb. But for now it’s about getting ready to go hiking and getting our legs conditioned to moving again. It’s raining down here; The Baksan River is swollen and very full. When we arrived in Mineralnye Vody there was light rain, when we got close to the mountains it began to rain harder. The weather forecast says it’s going to be going on for a couple of days but actually I’m pretty pleased because when it’s raining on the earlier part of the trip the weather is going to change in the mountains. I think we have got a better chance of good weather when we climb higher on Mt. Elbrus. There was about 30 cm of snow on the upper mountain yesterday though so we know there is a lot going on. I hope the weather gets better as we get ourselves ready to climb higher. As we approach this area today we were fascinated to see the monuments to the resistance fighters from the great Patriotic War. There is a lot of history and things that people don’t know about the culture of the Caucasus Mountains, of both recent and ancient history of the place. One thing that is really interesting is the great Patriotic War, or what much of the world called World War II, when the local people of these mountain valleys staged a heroic and dedicated resistance to the invading German armies. You see monuments to these fighters all around the valley where we are and even high on Mt. Elbrus. We are going to settle down now and get ready for a good night’s sleep before we go on our first hike tomorrow. We will keep you posted! 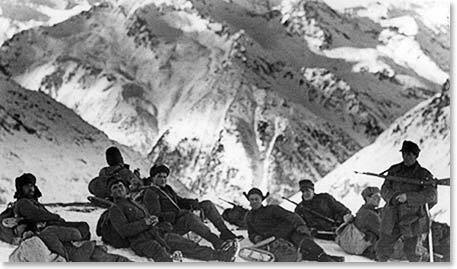 The Caucasus WWII resistance to the German Army; Caucasus fighters in full “gear” on the mountain. There is so much patriotic history to be learned about the Baksan Valley and the Caucasus mountains.